1. Kalen, did you draw your influences for this character from Kalhen son of Kalten of the clan of Kugan? The names are familiar enough, �birthed in the shadow�and�in shadow�, and both characters were beggar boys. Although the protagonist�s eyes are not the brown hue of that fellow, nor of Arthangur, another character with several interesting parallels, but I shall not speak on that for the moment, even though the color is interesting in it�s own right. 2. Given the actions of the transition of the sword, is it save to assume the weapon was given without it�s scabbard? This is another element of symbolism that works to compound with the name and eye color, although the self-inflicted bight marks are a nice touch. 3. You do realize there are about a hundred different ways the selection of a white headed elephant staff is significant here right? So� which ones influenced your choice of it particularly? 4. The wife�s name was also very good, �blameless with a pain.� Then you turn it round and blend it with the idea that her husband was forced to kill her after she was transformed into something without control over her actions. And this might come out as incredibly cruel, but I always get a bit of a giggle out of when somebody describes blind eyes as white. We choose to live a lie, when we see with, & not through the eye. Every decision, no matter the evidence, is a leap of faith; if it were not, then it wouldn't be a choice at all. 1. Kalen, did you draw your influences for this character from Kalhen son of Kalten of the clan of Kugan? 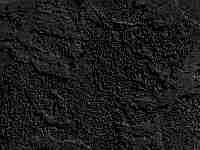 The names are familiar enough, �birthed in the shadow�and�in shadow�, and both characters were beggar boys. Although the protagonist�s eyes are not the brown hue of that fellow, nor of Arthangur, another character with several interesting parallels, but I shall not speak on that for the moment, even though the color is interesting in it�s own right. I've never heard of such a person (where does he come from? ), though I think it's cool you make the connection. Indeed, Gedrin walks away with the empty scabbard still on his belt. It can be assumed that Kalen acquires a new scabbard at some point thereafter. The self-inflicted bite marks are symptomatic of Kalen's condition, which is similar to CIPA. Basically, the way it works is that babies born with such a condition don't feel pain when they bite their lips and gnaw their fingers, so they end up with scars. 3. You do realize there are about a hundred different ways the selection of a white headed elephant staff is significant here right? So� which ones influenced your choice of it particularly? Hmm. As I recall, I chose the elephant to convey a sense of strength and stability. But now you've got me curious about these hundred different ways. A couple examples? I totally just made that name up, you know. If you're curious, it's a Rashemi name, and Gedrin's wife was a Hathran from that country. Indeed. I think of Gedrin's eyes as just kind of hazy, glass-like, and dull--any of which would have been a better descriptor than "white." Oops! Kalen's eyes are very pale gray (almost white), but he is certainly not blind. Kalhen son of Kalten of the clan of Kugan : He was a Mongol hero, and believed to have invented the first violin when his first horse, the equivlent to a unicorn, died. He lived for a hundred years and battled many horrors from the day that Atlantus was above the seas, which is another reason for why some people believed that Antlantus actually existed somewhere. All though originally the gave the island a different name, but the concept is strikingly similar and modern translators always use Antlantus for it. All of the tailes, and there dozens and dozens of them, have that sword and magic feel of Conan, although our hero is more ethical than that one was. It's usually everyone else that lacks morals. Look for "the Spirit of the plains" or Grasslands of fir," by Charles Crown, to read some of his adventures. Two characters that I can think of recieve a sword from a mysterious man in such a manner, our fellow above, from the Myst man, a mage and guardian of the earth sphere, after Kalhen battles the wild canables of Anthar, and gains many bight scars, and the Knight Aldwin, who recieves a sword from St. John, after being ravaged by beastmen. In middle literature, the unshiethed delivery of a sword is always a call to a greater quest, usually with holy implications. In zulu culture "White Elephent" refers to an old King or leader, that has ruled well, and while not in his prime, has plenty of experiences to pull from. The desstatment of how smooth it is made me think of Ivory, which made me think of "barrying the Ivory," a term in both Zulu and Indian culture that refers to an act where one if going to deal with a threat with the belief that one wont survive. The head of an elephent is also a symbol of recieving otherworldly power, he's a paladin, so their you go. "He's gone elephent" is a south african slang term for saying that somebodies clinging to something that others believe is old fashioned, he serves Helm, whose dead. In alot of Hindu mythos the saige carries an elephent staff, of these I mention Gzeally, who died battling Azmodi, he wielded an elephent staff and could fix men with his gaze and see what was scribed on their hearts. In african hindu, and even in chinese myth, the elephent staff was only wielded by men that had endured some horrible trial that coast them their most precious thing on this world, family, love, family artifact; had to be pure of heart, but necesarily always that way; and were forced to endure many trials. In chinese myth, the weilder of such a staff was always betrayed in the end and those agencies they were closely linked to were always subverted. This makes me wonder about any organization our Paladin was associated with. It's a Rashemi name, and Gedrin's wife was a Hathran from that country. I thought as much, it sounded Gypsey, and that's where the meaning comes from. The Hathran is a part of their mythos, so you can see my thought process. I am a giant language fan by the way, love it as much as I love the written word. "The Caper," chapter three of my Pathfinder story "Proper Villains," is up on Paizo! Conclusion next week! My method of lunch-time reading at work on Fridays is very quickly becoming used to having new fiction from you Erik. Apparetky I'm the people's FR writer. So, having finally read through that web-fiction for Golarion, I noticed one of the female spellcasters had the last name "Hathran." Was that an intentional nod to the Realms? Stranger things have happened! Good catch. New subject: You're lucky I love you. Being the stickler I am for precision detail, on my new map of The North I placed Quaervaar just outside the forest, where it was on the original North maps. Then I remembered certain details of your story, and placed it just within the forest (which in my mind is incorrect, and normally I wouldn't change a map because of a novel). I suppose one could assume over time (especially with that ghost-thingy gone), the forest would had receded from the settlement, but that means the maps are chronologically out-of-order (the older map showing how it would have been in latter years). I guess we could also blame it on Druid over-achievers and the Shades having flooded most of the Realms at the start of 3e (the climate got warmer, etc). With the RAS-created Winter's Edge, and the new (as of Silver Marches) sub-road from the northern climes, I think the amalgam came out rather intriguing. Quaervaar becomes the new waypoint on the tradeway between Silverymoon and Mithril Hall, after the Surbin Bridge is complete, which would increase its influence (and size) significantly. Maybe you could do a story on how Shadowbane meets Ghostwalker and they form a sort-of 'Night Stalkers' alliance in the new Quaervaar. It would be like Batman working with Deadman. Hmm, I didn't mean to suggest in my novel that Quaervarr is "just inside" the forest. What details suggested that? My lead source material was the Silver Marches book, though I referred to other books available at the time (3e FRCS, etc). I didn't have my 2e maps at the time. And yes to Shadowbane + Batman. I seemed to have mixed comic companies with my reference (since the Night Stalkers was a Marvel title, but you got the idea). As for the why of the map placement - the envoys from Silverymoon (like the one killed right in the beginning) traveled through forest, and if I showed no forest between the two, that would have been a little odd. 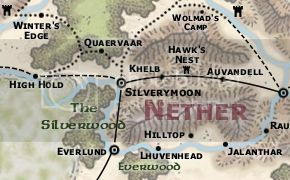 The 3e (Silver Marches) map does show it right inside the forest, and since you wrote that in the 3e period I assumed that was why you had folks traveling through woods coming and going from Quaervaar. On the other hand, pockets of 'small woods' are supposed to exist all over the place, way too small to illustrate on a continental map, so that also works as an explanation. Either way, I split the difference and am very happy with the results. That was small potatoes to some other things I have to deal with, like why a major road was shown going through the Stonelands on the 3e map. Rather odd for a 'no-man's land' kind of area, no? It's not just about making maps, for me, its about getting everything to make sense. I suppose "just inside" is a subjective measure. I checked the Silver Marches map, which seems to show about five miles of forested road (and several more over the plain) between Quaervarr and Silverymoon. Do you have a differing interpretation? I just added a link to my above post. On the old map of The North (which came with the 2e product of the same name) the town was shown just outside the woods, and that is also how it was shown in the FRIA maps. Like I said above, I am very happy with how it all turned out. Ah, I see. I was a little confused by your original post, but now I understand. It's also a valid point that forests do expand and contract over time. What was true in the North might have changed for 3e. It also might have been a cartography error in the first place, or perhaps the old map just didn't have that detail. It's not a major discrepancy anyway, IMO. If there is one thing you should have learned about me by now, its that every little thing bothers me. That area got smooshed in 3e (as did everything else), and I 're-inflated' it, but then when I got to Hartsvale I had to smoosh it back down just a tad. The Cold Wood is supposed to be directly west of Hartsvale, and the Silver marches map had it way too far north. Others areas I got much closer to the 1e/2e maps, but this region really took some finagling. Unfortunately, with all the old locales I found coupled with the many new ones added in SM, a region that is supposed to be 'sparsely settled' is now one of the busiest areas on the map (beaten only by Cormyr). I guess that makes sense, since those two regions are probably the two most used campaign areas. Hi Erik. My question is on Davoren Hellsheart, i read up on him in the dnd website and the last part stated he was heavily scarred and when asked only mentione 1 word, "Twilight", and i know from DOM that he was eaten alive by Tlork. Did he really survive or was that an inconsistency? Second, is Davoren still around in the Realms of Today? Hi Xar, apologies in advance for being a little evasive, but you're asking about an ongoing plot. I have to be a bit cagey. He encountered Twilight at least once more, around the mid 1380s. Though to reveal more would be cheating. Erik, what did you think of The Dark Knight Rises and, in particular, Nolan's interpretation of Bane? I am not an expert on Batman (just a fan), nor do I know all that much about Bane (he's one of the fuzzier villains in my mind), but I will say that I quite enjoyed TDKR (enough to see it twice in the theater), and found Bane a compelling (if at times vocally incomprehensible) and legitimately threatening villain. I thought he was exactly the villain the movie needed. My favorite aspects of the movie were Catwoman (whom I thought Hathaway portrayed quite well) and the secret villain twist (which would give it away if I said the name, but you know who I mean). The trial by fire/faith subplot was also cool, though I question whether one can recover from a slipped disk by someone just shoving on it real hard. Originally posted by Erik Scott de Bie...though I question whether one can recover from a slipped disk by someone just shoving on it real hard. Worst nemesis of Aquaman--they fight over most useless power all the time. There are PLENTY worse powers than Chiropracty.